The Chicago Film Society strives to keep the experience of seeing films on film exciting, viable, and accessible. We have been lucky to work with many studio and archival partners in realizing this vision. However, with film prints becoming less readily available from conventional sources, we recognize that it is also our responsibility to directly support and encourage film preservation and circulation. In 2013, we received a grant from the National Film Preservation Foundation to produce a full photochemical preservation of Corn’s-A-Poppin’ (1955), an independently-produced regional film written by Robert Altman. The original camera negative for Corn’s-A-Poppin’ is presumed lost. The only extant elements are 35mm release prints. We have utilized two such prints–one from our collection, another on loan from the Wisconsin Center for Film and Theater Research–to create a complete duplicate negative. The new 35mm wetgate picture and soundtrack negatives have yielded the first new prints of Corn’s-A-Poppin’ since the 1950s. Laboratory services by FotoKem. Read more about the film here. Special thanks to: Kian Bergstrom, James Bond, Evan Chung, Maxine Ducey, Dino Everett, John Kostka, and Kim Young. 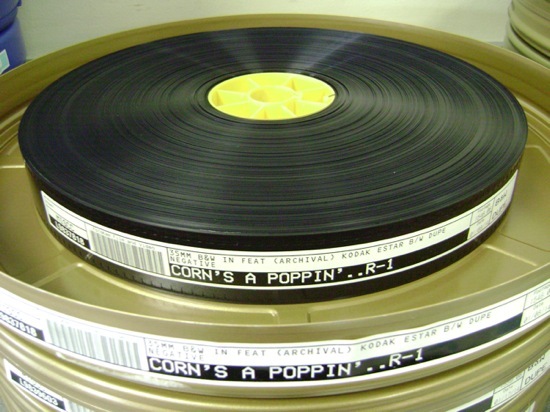 The new 35mm print of Corn’s-A-Poppin’ is available for screening to any venue with an archival-quality projection booth. Please write to info@chicagofilmsociety.org with screening inquiries.